We decided to come up with the best in-ceiling speakers. This was another fun project for us. Of course we had our usual criteria for high-performance, sturdy design, ease-of-install and power, but we were also able to pull out all of our music and movies. We tested them all on each speaker to see which ones projected the best sound regardless of what we were playing through them. We are happy to say that the following four products are all stand-outs. They managed the low-, mid- and high-ranges of sound easily and never squelched or broke up the sound. Without further ado, here are our top picks and why we decided they were the best the market has to offer. After testing, we decided that the Polk Audio RC80i 2-Way In-Ceiling Speakers were our number one gold product. We were won over by their power, clarity and ease-of-installation. Here are our thoughts on these speakers. The sound on these Polk in-ceiling speakers was great. We loved how the sound was able to carry—regardless of what we were playing on the entertainment system. These speakers were built with 8-inch dynamic balance and a mineral-filled cone of polymer-composite. This allows them to perfectly recreate sound and bounce it to those listening in every area of the room. Plus, the polymer-composite is high-performing and lasts much longer than some other foam options. The speakers also are built with a soft dome tweeter that has a 15-degree swivel system to it. When you mount it, you can adjust easily. They produce a frequency response of 35Hz to 20kHz. It’s no wonder we liked them a lot. They are built to project sound and create a theater-like atmosphere. They include a glass-filled composite baffle that gives a fullness to their sound regardless of what you are playing at the time. The speakers are 3.5-inches by 12.1-inches. They also are rust-resistant in hardware and moisture-resistant. They can be installed easily into a bathroom or sauna—anywhere that is high-humidity is fine. We loved how versatile these speakers are. They can even comfortably be set in an outdoor area. Wherever you want outstanding sound and powerful delivery of audio clarity, these speakers can be used. The full package comes with the two speakers, two grilles, and 2 handy cardboard templates with masks for painting. Speaking of the templates and painting, we also loved how easy it was to install these speakers. We definitely didn’t want speakers that require professional installation or difficult to manage sawing. With these, all you have to do is cut the ample hole for their housing, feed in the wires and drop in the speakers. You can position them anywhere you want and they can be adjusted easily. The grille surrounding the speakers can be painted to match the color of the ceiling, so you won’t even see much of them. All you’ll know is that the sound in your room is fantastic. The Polk speakers are robust and durable. We particularly enjoyed how stealthy they are. Once you install them, you can easily forget about them. They come with a tweeter-level switch that enables adjustments of sound depending on the room’s height and width. The customization factor of these speakers is what sold us. We realize that we have a lot of different people and want to make sure when we pick a product as our best, we are serving the majority. These definitely do! If you are sold on Polk as a brand, these speakers work perfectly with a timbre-matching technology. They sync up with all of your Polk brand entertainment fixtures. The good thing though is that they are flexible enough to work seamlessly with other brands also, so you aren’t tied to Polk, unless you want to be. 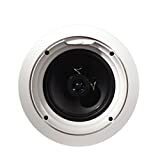 For anyone in need of new in-ceiling speakers, consider the Polk Audio RC80i 2-ways. They likely are all that you need when you are setting up your entertainment system. Yes- they are that powerful and effective. Coming in at number two for our silver product slot is the Yamaha NS-IW280CWH 3-Way, In-Ceiling Speaker system. We liked this choice primarily because of its ease-of-installation and easy management of the mid- to high-ranges. Our official thoughts are that they are a fantastic choice for your home theater plan. This Yamaha speaker system is a comprehensive sound package. We liked that it has a lot of power along with clarity. There are two 6 ½-inch polypropylene mica-cone woofers to the package. It has a dual ¾-inch tweeter that utilizes SoundMax technology. This is a technology that interprets audio signals and allows devices to process them and transmit them at the appropriate level. By using this feature, Yamaha ensured that their 3-way sound system would definitely take advantage of its build. The speakers have a tilt-design to them to allow users the ability to customize sound based on their room set up. We love when manufacturers offer customizable options because we feel it is a sign that they truly are looking out for the buyer. These speakers also have a swivel-feature that helps to disperse music in the direction most-desired. When it comes to power, we found that the Yamahas offered everything. They have 100watt maximum capacity, so regardless of what you’re playing, you’ll hear the sound throughout the entire house. Many people use these speakers as a basis for their entertainment center—which is the perfect application. They make it possible to hear the tiny sounds on the backdrop of a soundtrack when listening to movies or music. They have a frequency response of 65Hz to 28 kHz and their sensitivity level is 85dB/2.83. We tested out all of our speakers and how well they projected music and movies. These held up to whatever we were playing and let us hone in on every whisper—always a good thing when watching movies. We also loved their performance in different settings. We listened to movies and music with these speakers installed, and without the speakers. We noted a definite plus when using them as an integral part of the sound delivery. They helped to create a true surround-sound atmosphere. Without them, we could hear the lack of richness. Once we had our Yamahas set up, they handled the mid- and high- ranges exceptionally well. If you want to capitalize on the deep bass sounds, these speakers can supplement, but we’d suggest speakers built for specifically that. Managing the higher timbers though, is not a problem for the Yamahas. 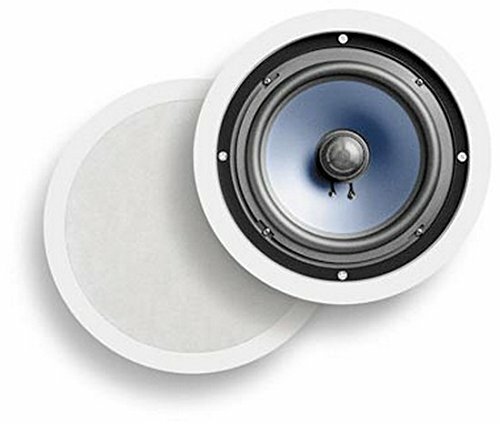 Installation is simple with these in-ceiling speakers also. Just like the Polk Audio speakers, you decide where you want to house them, cut your hold, insert the wires and drop the speakers in. Their grille is paintable, so you can easily hide them in your ceiling and out of sight. The full dimensions are 10 9/32-inches by 5 1/16-inches. Mounting depth is 9 7/16-inches by 4 13/16-inches. We always look for items that are easy to use and easy to install. These definitely fit the bill in both cases. If you are looking for great speakers that are easy to install, there is nothing like our gold and silver picks. You won’t have to be an engineer to get them up and running. 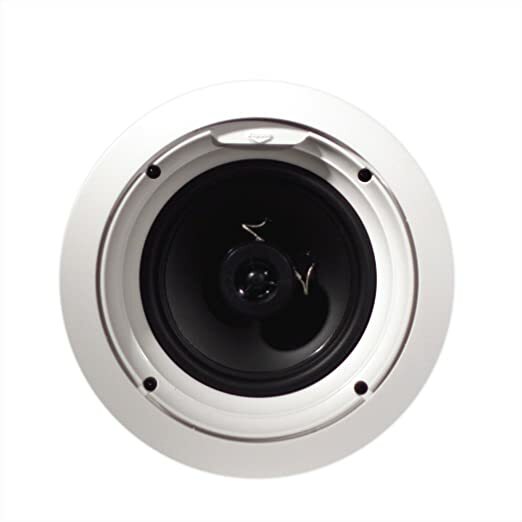 Our silver pick, the Yamaha NS-IW280CWH are fantastic choices for your in-ceiling speakers. You’ll love their performance and can easily hear how much they contribute to your listening experience. Our bronze product is the Klipsch Reference Series R-1650-C In-Ceiling Architectural speaker. We loved this as our third pick because of their sound quality. We tested them in every setting possible with every type of music. No matter what we threw at them, they gave us crisp and clear sounds back. Here are our official views on the Klipsch. We also liked the power of the Klipsch. Their frequency response is 57Hz to 20 kHz with 35-watts of power amps. They have a two-way system that uses 1” polymer dome tweeter along with the 6 ½-inch woofer. We liked that these speakers are recommended by the manufacturer for home- and commercial use. We definitely can see it. After testing, they held up well to everything and that’s why they made it to our number three pick on the list. We particularly liked the overall performance of the high-ranges with these speakers. They projected well and handled sound perfectly. Installation for these speakers is average—the same method as the others we listed as our top picks. Just cut the appropriate hole, wire the connectors together and drop the speaker in. The Klipsch also has a grille made from aluminum that is paintable. That means that they can easily be disguised to blend in with your décor. The installation instructions are easy to follow and the hole needed to house them is 9 ½-inches. Each speaker weighs 5.1-pounds. Finding speakers that were visibly unassuming but offered powerful sound was our goal and these delivered. Regardless of how we utilized these speakers or what we asked of them, they were great at carrying sound. As stated, they seemed better with the high- and mid-ranges. Some of the lower ranges were lost. Still, as an integrated part of your sound system (and not your only speakers) they performed great. They were able to create a true theater-like experience. If your goal is to create a movie room or an entertainment center that allows for theater seating and sound quality, these may be the perfect option to get you started. 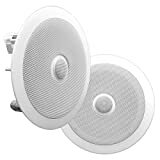 Plus the fact that they are so easy to install, makes them a great choice for just about anyone in need of in-ceiling speakers. We are proud to round out our list of top three with the Klipsch Reference Series R-1650-C in ceiling architectural speakers. They offered a fantastic sound to supplement any media room you can come up with. Plus they are affordable and easy to install. Test them out and you’ll likely be as big a fan as we are. After we find our top three, we always go back and get that one pick that we found hard to walk away from. It either performed exceptionally well or had some notable feature/s that we thought made it a deserving pick. Despite not making it to our gold, silver or bronze spot, we still decided it deserved some recognition. This is the pick that become our budget product. For this list, our budget product is the Pyle PDIC60 In-Wall/In-Ceiling Dual 6.5-Inch speakers. They offered a great sound along with power to any room we tested them in. They were easy to install and easy to integrate into any media room. We went back and included them on our list because of all these features that set them apart from the rest. Here is our official assessment of the Pyle speaker system. The Pyle speakers have 1-inch titanium dome tweeters and work at 250-watts. We loved how powerful these speakers were. Though they are small, they deliver a lot of sound. We blasted our soundtracks and music though these and they projected sound throughout any room we stationed them in. As with our other choices, we put these speakers through the ringer in terms of sound—we played everything from death metal to classical and soundtracks to full albums. Our main focus was to find all of the speakers that could handle everything we threw at them equally as well. These definitely did! We also loved the look of the Pyle speakers. They are easily flush-mount for maximum integration. Any ceiling or wall will easily house them this-close to secretly. Sure you’ll see them if you look, but if you don’t all you get is clear and crisp sound coming directly at you. One thing we noted about their design is that they were flatter than some of our other options. We really liked this because of how well it made them stealth speakers. When you have a media room, you want great sound that allows people to focus on the music or the movie being played—not the fixtures producing them. These are the perfect solution to having unassuming sound tools that still perform well. Their flat-shape also lent itself well to delivering sound. We noted that they never broke up the sound when we pushed them to their max capacity. 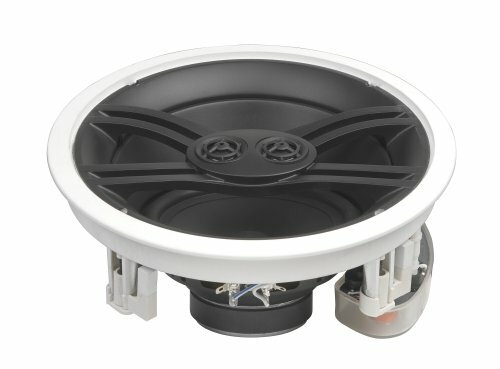 The Pyle speakers are 6 ½-inch in diameter speakers that perform at 4-8 Ohm delivery and a 1-inch high temp voice coil. The dimensions are 9-inches and 2 3/8-inch depth. Cut out is 7 7/8-inches by 4 5.8-inches. Each speaker weighs 7-pounds. We especially liked the weight distribution of these speakers and can see them easily integrated into any media room, office, or kitchen. The power is fantastic and they handled the low-, mid- and high-ranges equally well. One thing we noticed with lesser-quality speakers is that they didn’t handle all ranges. For example, they projected highs, but made a mockery of the mids- and lows. We definitely didn’t want to give those our backing. We were highly satisfied with the performance of the Pyle speakers. Our primary reason for picking these as the budget pick, after their sound delivery, was their ease of installation. As long as you get the cut-out right, you’ll quickly have them installed. Rather than a hefty mount to hang them, they come with convenient clips that snap in. You will need a Phillips screwdriver to get the job done, but likely you can get it done within a few hours—depending on your room’s layout. In the end, as a budget buy the Pyles were fantastic. They performed outstandingly well. For their size, they delivered a lot of sound and we were happily surprised at its quality. If you want easy-to-install speakers that are also easy to mask into your wall or ceiling, these are the perfect option. Plus, at the prices we saw them at they are a great buy on top of everything else. When it came to our pre-purchase considerations for in-ceiling speakers we decided that sound quality and delivery would be first, which makes sense. We are always looking for the best products that offer the best quality regardless of what they do. Next, we decided that ease-of-install was a big concern. We wanted to recommend only the products that were easily hung. Because these are in-ceiling, we understand that some knowledge of carpentry is going to be needed, but we wanted it to be basic. Anyone who can cut a hole, attach a few wires and paint can easily install our choices. Next, we considered the look. We didn’t want anything obtrusive or bulky looking. Finally, we looked at the speakers’ overall sound power. Put together, we had a comprehensive list of the criteria needed to win us over. Here are more details on how we broke down each one. We had a lot of fun with this project because it involved listening to music and watching movies. Admittedly, we picked the movies with some of the best soundtracks. We did this to keep the day fun, but also to see exactly how each of our contenting in-ceiling speakers would hold up. They were each tasked with projecting “Grease” and “The Rocky Horror Picture Show” along with “A Hard Day’s Night” and “Planet of the Apes.” Not to mention their delivery of song after song. We wanted to be sure that the speakers we chose as our best really could handle all genres of music and movie soundtracks. We considered the low-, mid- and high-ranges and how well they blended together. We paid special attention to any reverb or scratchiness to the higher-end sounds. Any speakers that couldn’t handle them were immediately packed up in their boxes and out of the running. The ones that held up, did a great job and made it to our finalists. Next, we looked at how easy each of the in-ceiling speakers would be to install. We wanted to be sure that the general public wouldn’t have to take a class in carpentry to install their speakers. Again- we understand that some work is needed, but we wanted it to be the least amount of effort possible. With all of our ending picks, installation is as simple as cutting a hole, connecting wires and dropping the speakers in. That’s as much effort as we wanted our readers to need to get their sound system up and running. We also looked at what tools manufacturers included to help with installation. We gave extra points to those that included wall/ceiling templates. These are always helpful when deciding where exactly to put the speakers. We also liked manufacturers who included grille covers for the speakers. We liked manufacturers even more if the grille covers matched the outer frames. Finally, we also noted the installation tools like handy clips or specially designed mounts. These rounded out the packages for us and made install that much easier, which is exactly what we were looking for. We also assessed the overall look of the speakers. When we recommend a product we always look for clumsiness and bulkiness. Our goal is to veto these products right away unless they have some amazing benefit that keeps them in contention. Most of the speakers we looked at were equitable in look but early on we did have a few that just didn’t fit the bill. We understand that as homeowners, people want things that look good in their home. These models are meant to be stealth but that doesn’t mean you won’t see them at all. If a visitor does see them, we wanted them to look high-tech. Finally, we looked at the overall power. Some devices will end up in small family rooms where room size isn’t really factor. However, other speakers will end up in large entertainment-centered rooms where sound is everything. We wanted to be sure that if a customer put thousands of dollars into his/her sound room, the in-ceiling speakers they chose would hold up. We wanted speakers that had a good amount of strength to deliver quality sound. When listening to our soundtracks, we purposely put them on high volume to make sure that the speakers we chose we able to handle them. Happily, all of our final picks were great at whatever music or movie we played—regardless of how loud we went. So there you have it—our gold, silver and bronze pic along with our budget product for best in-ceiling speakers available. We played a lot of movies and music for this study to make sure that the speakers we chose would stand up to anything. We’re happy to say that our final choices are great picks for whatever sounds needs you have.